Situated in north-eastern Africa, Egypt is a country like no other. This stunning country is perhaps best known as the home of the ancient Egyptian civilization, with its temples, hieroglyphs, mummies, and - above all - its pyramids. The colossal monuments along with the beautiful turquoise waters make Egypt one of the most popular tourist destinations world-wide. Egypt is in north-eastern Africa and has coastlines on both the Mediterranean Sea and the Red Sea. The country borders Libya to the west, the Gaza Strip and Israel to the east, and Sudan to the south. Its capital is located in its largest city, Cairo. It is dominated by the Nile River and its valley, and by the Eastern and Western deserts. Egypt also extends into Asia by virtue of holding the Sinai Peninsula. Enjoy a romantic cruise along the Nile, the world's longest river and discover the stunning colossal monuments of Ancient Egypt. Daily life in ancient Egypt revolved around religion. The land was filled with temples. 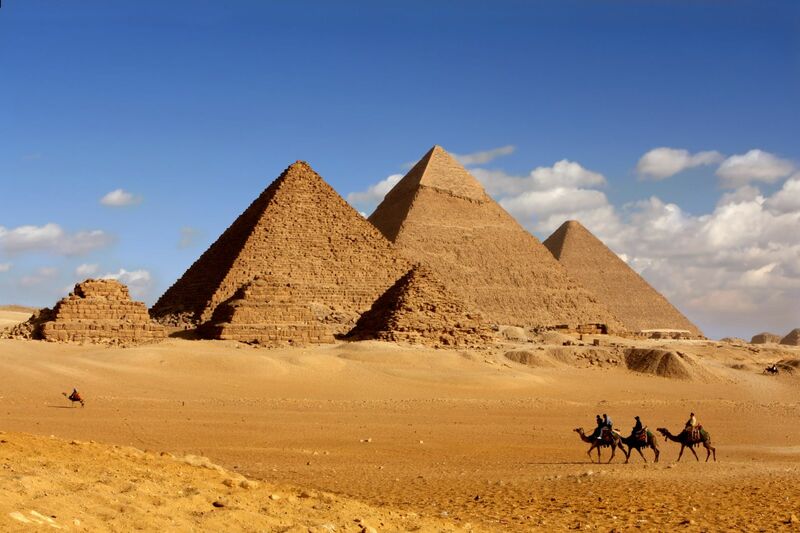 A strong belief in the afterlife led the people to build pyramids as tombs for the pharaohs. Various tours are available for tourists that usually last between five and fourteen days. The tours make their way up the Nile river, visiting pyramids and other tombs, temples, museums and various other tourist sites. 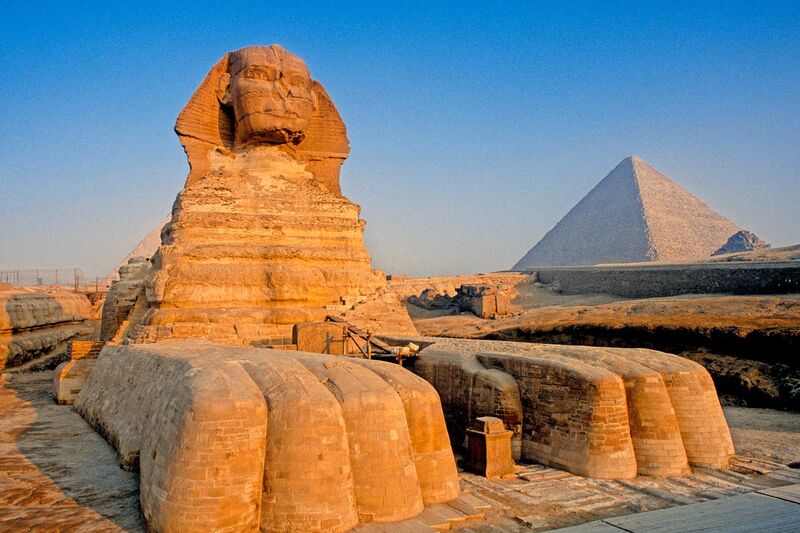 All tours include a visit to the Giza Plateau - the most famous man-made structures in the world. You can also explore the Saqqara for a tour of the Step Pyramid complex of Djoser. Egypt is often described as a sportsman's paradise, especially for divers. Winters are still sunny and there is a cool north breeze in the summer which makes outdoor games an all-year round possibility. With the exception of snow-sports, there is hardly a game which is not played in Egypt. Many of today's sports were practiced by the Ancient Egyptians, who set the rules for them. Inscriptions on monuments indicate that they practiced wrestling, weightlifting, long jump, swimming, rowing, shooting, fishing and athletics, as well as various kinds of ball games. Cairo is the only city in Egypt with a metro system. Taxis are cheap and efficient. Make sure to agree on a price before getting in, as they might take advantages of tourists who do not know the system. 14-seat minivans run informally through some towns and cities, and usually you pay the driver as you're getting out at your destination. The two top religious leaders in Egyptian Islam are the Shaykh al-Azhar, who heads the religious bureaucracy, and the Grand Mufti, who offers authoritative interpretations of the Koran. The two main Muslim religious holidays are the feast following Ramadan and Eid al-Adha, which corresponds to the Muslim pilgrimage to Mecca. The Ramadan holiday comes after a month of fasting. It is celebrated by visiting family, and generally resting. The Eid al-Adha celebrates Abraham's willingness to sacrifice his son, who then miraculously turned into a ram. Other religious holidays include Moulid an-Nabi, commemorating the birth of the prophet Muhammad, and the Islamic New Year. The Egyptian summer is hot and dry in most of the country, and humid in the Delta and along the Mediterranean Coast. In recent years the humidity has spread to Cairo, and the city swelters in August! Winter is mild with some rain, but usually there are bright sunny days with cold nights. Explore the Great Pyramids and the Sphinx in the Giza Plateau, bathe in the Oasis of Siwa, and discover the Valley of the Kings in the ancient city of Thebes. Avoid travel to Egypt from 15 May until 30 June because of the scorching heat. January or November is generally the best time to travel as the weather is still beautiful, but not at an overbearing heat. Deals are usually cheaper in these months also. There are a number of languages spoken in Egypt, but Egyptian Arabic is by far the most widely spoken in the country. English is the most commonly used foreign language and most of the street plates are written in both Arabic and English - so don't worry about getting lost! Egypt is a Muslim country, so remember to respect their faith. Kissing in public and wearing revealing clothing are frowned upon by most locals, so try to be conservative in your attitude. Tap water is fine to use for washing and cleaning your teeth, but it is not advised to drink it. Bottled water is cheap - make sure to drink a lot to avoid dehydration in this hot country. The Currency in Egypt is the Egyptian pound and it is divided into 100 piaster. Most of the major credit/debit cards, such as American Express, MasterCard, Visa, all Euro cards and JCB, are widely accepted in various hotels and shops. If you want to use an ATM machine, they usually accept Visa, MasterCard and Cirrus cards. There is a high threat of terrorism in some parts of Egypt. Attacks could be indiscriminate and occur without prior warning. Attacks targeting foreigners can't be ruled out. Be sure to check foreign travel advice before travelling. +The Red Sea and its wonderful marine life. +Unique cultural heritage: the Pharaoh dynasties left a host of fascinating and beautiful relics. +Egyptians are remarkably friendly and welcoming. -Too many boats on the Nile therefore tourist sites are crowded, especially during high season. -The systematic request of 'baksheesh' (tips) in any circumstance. -High level of traffic and pollution in Cairo. Ramadan is a holy month for Egyptians and during this month people celebrate with friends and relatives. During this month Egyptians stay awake at night and spend time in prayer and spiritual activities. Haggling is a must in the souks! You can find really good offers, although be realistic with your offer, as the seller has to make a living too. In general, men and women have equal rights in Egypt. However, equal pay applies only in the formal sector. In the informal sector, women are often paid less than men. Household work and child rearing are almost exclusively women's responsibility. Legal rights also differ between genres in relation to personal status, e.g. marriage, divorce, child custody. Only Egyptian men have the right to pass on Egyptian nationality to their children. Various feminist and human rights groups are currently active in promoting legal change in areas of discrimination against women. Public modesty in dress is highly valued in Egypt. Women are expected to cover their body except the hands and face. This usually means wearing a head scarf that covers the hair and ears, although some prefer to cover their entire face. However, many women now choose not to wear a veil at all - a topic which is currently hotly debated in modern Egypt. For both men and women, the principle is that clothes should disguise the shape of the body. Thousands of years ago, ancient Egyptians left evidence of their love for food. Well-preserved wall paintings and carvings have been discovered on tombs and temples, showing large feasts with a variety of foods. Many of these ancient foods are still eaten in Egyptian households today, including peas, beans, cucumbers, dates, figs, and grapes. To start off meals, mezze (a selection of appetizers) is usually served. The national dish is "Ful medames", which consists of cooked fava beans in vegetable oil usually served with onions, cumin, chopped parsley, garlic, onion, lemon juice and chilli pepper. Another very popular dish is "Mulukhiyah", a thick soup made from finely chopped leaves of this plant, along with peppers and garlic, and then served with rice and pieces of chicken. As for desserts they are Oriental-style and made with honey and oil. A popular dessert is Baklava, which is made up of layers of flaky pastry filled with chopped nuts and honey syrup. Egyptian desserts are best served with carcadé (a herbal tea made from hibiscus flowers), served hot or cold, or a strong thick Turkish coffee. Find weekly weather forecasts for Egypt . Different criteria make it possible to predict with precision the best time of year to go to Egypt . A comprehensive weather score, made up of temperature indicators, bad weather predictions, sunshine levels and wind speeds, will allow you to choose the activities best suited to the weather conditions and therefore make the most of your holiday in Egypt . The pantheon of Egyptian gods has been immortalised in the form of small figurines made from alabaster, basalt, soapstone and... resin imitations sold at the entrances of all the Temples (£2.5 to £5 a piece). You will also find some beautiful cotton items: a tablecloth with 12 napkins (£11); t-shirts (£4); and cheches (£1 to £3). To find real papyrus, go to the Dr. Ragab Institutes in Luxor and Aswan . Buy cheap silver and gold jewellery, turquoise and lapis-lazuli, and the inevitable engraving of your name in hieroglyphs in Luxor (cheaper here than in Cairo). In Cairo, on the other hand, you can find beautiful copper pieces (trays and hookahs), marquetry and multi-coloured glass art. For spices: go to the Aswan souk. Shops are generally open from 9:00am to 10:00pm and later in the tourist zones, every day except Sunday. Our journalists' reviews for you 256 hotels Egypt . Take a look at our hotels, their facilities or their value-for-money score according to your departure dates so that we can find the best offer to suit you Egypt . Book a hotel Egypt it's never been so simple !